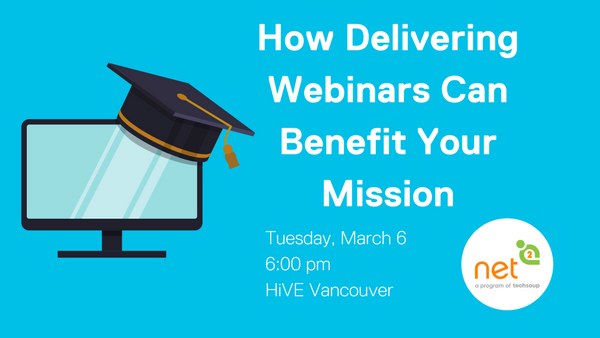 Local webinar experts Tonya Hyde and Chad Leaman presented case studies at the March 6 Net2van meetup on why their organizations pursued webinars as part of fulfilling their mission. This entry was posted in Event report and tagged Marketing, training, webinars on March 25, 2018 by admin. Our March 6 NetSquared Vancouver meetup will be co-hosted by Tonya Hyde​, Professional Development Coordinator with Engineers and Geoscientists BC and Chad Leaman​ of the Neil Squire Society. What are the top two ways nonprofits can use webinars as part of their programs? What questions should you consider when choosing your webinar platform? This entry was posted in Uncategorized and tagged webinars on March 2, 2018 by admin.